The Metropolitan Water District could build a second Delta tunnel, a reporter reflects on a trip to a dry wasteland and more in our biweekly roundup of environmental news. In 2014, nearly 70 percent of San Diego voters backed a $7.5 billion statewide “water bond” meant to fund a host of water-related projects. Right now, though, the officials in charge of handing out money from Proposition 1 are taking a dim view of the biggest water project planned for San Diego, the city’s multibillion-dollar effort to turn sewage into drinkable water. The project, known as Pure Water, is looking for a $219 million state grant. Whether it gets that money is up to the California Water Commission, which is responsible for handing out $2.7 billion in bond money. In February, the commission’s staff concluded that Pure Water would have no benefit at all to the public, according to the scoring system the commission uses. That scoring system is the product of prolonged negotiations between state lawmakers. It forces the commission to focus on issues affecting the Sacramento-San Joaquin Bay Delta, a series of waterways and wetlands fed by snow melting in the Sierra Nevada mountain range. 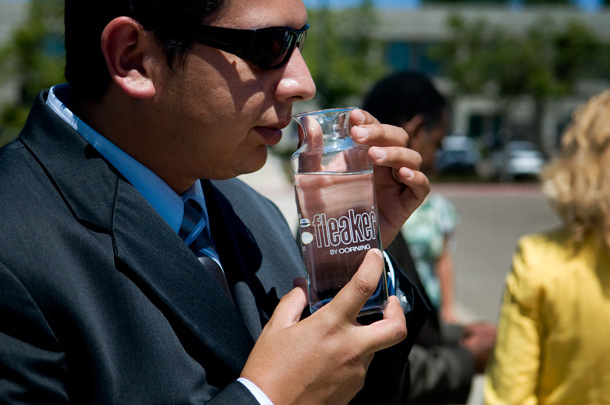 Pure Water is designed to help reduce the amount of water San Diego must import from far-away rivers. It will also improve the quality of coastal waters by reducing the amount of treated wastewater being dumped into the ocean off Point Loma. But neither of those things directly helps the Delta. The commission’s view — which has stirred up controversy for weeks and put the agency on the defensive — is that the project has to improve water quality in the Delta and has to reduce the amount of water being taken from Northern California. San Diego does not control how much water is brought into Southern California from Northern California, though, so it can’t promise to reduce the amount of water coming south. And Southern California’s chief water importer, the Metropolitan Water District, said forcing the region to stop taking one bucket of water from Northern California for every bucket of water it tries to recycle locally “actually decreases regional reliability” — which is probably not what San Diego voters had in mind when they voted for the water bond. Overall, the San Diego County Water Authority said it is still too early to know if the region will get its “fair share” of bond money. Mike Lee, a spokesman for the authority, said one of the bigger-ticket spending items, $80 million to help prop up the Salton Sea in Imperial County, has indirect benefits for San Diego. That’s because the water agency out there, the Imperial Irrigation District, had been threatening to blow up a deal to sell lots of its water to San Diego unless someone helped repair ecological damage around the sea. The bond money helped create a peace deal, for now. The first stage of the Pure Water project is supposed to produce 30 million gallons of recycled water every day and cost $1.4 billion. Tuesday is a big day for the project. The City Council is voting on whether to approve the project’s environmental impact report. While recycled water was once victim of the “yuck” factor and known as “toilet to tap,” it has gradually gained widespread acceptance. Most of the opposition now is from neighbors who are worried about construction or pipeline spills, not about the treatment process itself. The city is looking for other sources of money to help fund Pure Water, including a grant from Metropolitan that was caught up in Water Authority litigation. Seth Gates, the water department’s finance director, said the department wants grants rather than loans; ratepayers have to pay back loans but not grants. But, if the grants don’t happen, the city is optimistic about getting low-interest loans from the state and the federal government. Speaking of the Delta, for decades — ever since Jerry Brown’s first stint as governor — California water officials have been looking for a way to replumb the water system that brings water south from Northern California. The latest iteration of that plan, a $17 billion pair of 35-mile-long underground tunnels, has been up in the air for months. The board of Metropolitan, which imports water for 19 million Southern Californians, voted last fall to pay its $4 billion share of the project. But other water agencies, including a major farming district, backed out of the deal. In recent weeks, Metropolitan’s staff has talked about working with other interested water agencies to build one tunnel, at the cost to Metropolitan of $5 billion. But several board members have pushed the idea that Metropolitan should just go ahead and build a second tunnel and bear $11 billion of the cost — a head-spinning turn of events even for those involved. Early last week, Metropolitan staff said it looked too risky to take on that much debt and recommended the board vote to fund just one. Then, mid-week, several board members suggested they might be able to get enough votes to build both at once. The thinking is that, eventually, other water agencies will need water from the tunnels and Metropolitan can charge them to recoup its investment. The vote, which is Tuesday, seems likely to be a close one. San Diego’s representatives on the Metropolitan board oppose both plans now because of the seesawing events. Brett Barbre, the chairman of the Municipal Water District of Orange County, is among the Metropolitan board members trying to get together the votes to build both now. Orange County thinks about things differently than San Diego. To officials there, the cost of the project to ratepayers has changed very little — it’ll amount to about $5 a month, Metropolitan argues — and the risks of not securing the link to Northern California’s rivers is immense, due to rising sea levels and earthquakes that could damage the current system. • A new report looks the multibillion-dollar risks San Diego faces from sea level rise. • Researchers at UCSD’s Scripps Institution of Oceanography found two new worm species. One is named after the institute’s namesake, Ellen Browning Scripps. • A judge ruled against the Golden Door resort’s effort to stop a nearby housing development because it wouldn’t have enough water. As we reported in late 2016, the questions about water supply were largely a goof-up by the local water district.